A high temperature version of the most popular kiln we sell. Happy to fire Stoneware or Porcelain without any stress. Identical to the standard Studio 1 apart from the slightly thicker chamber walls and higher amperage power supply, (up from 30 to 34amps). Perfect size for the more serious Pottery Party mobile studio wanting to fire pieces from more than one party at a time, or invaluable in the Contemporary Cafe as the overflow kiln for those extra or rushed items. 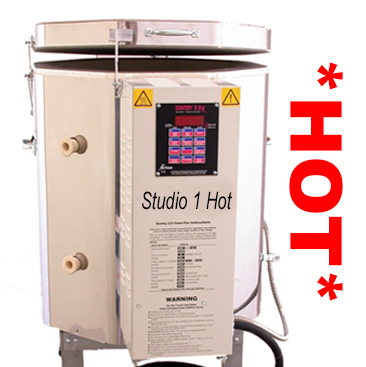 A Studio 1 kiln is easily our best selling kiln. This version has a 16½" x 22¼" chamber giving a very useful 2.95 cu. foot capacity. More important than the volume, is the actual dimensions. This is the shelf size the vast majority of bisque wholesalers sell their items to fit onto; platters, figurines, vases etc. Wide enough to get small 8" plates side by side, yet comfortably taking those 14 or even 16" wide wedding plates and platters. The potter looking to fire Stoneware or Porcelain to higher temperatures will find this kiln will accommodate big items, and with the Sentry 2 controller, (intensively developed by Paragon and the Orton Ceramic Foundation), anyone can fire them easiliy, economically and, with the choice of fast medium or slow firings, safely. The controller allows you to fire in the early morning hours to get advantageous low cost electricity tariff rates, the stainless steel and brick lid means goodbye to sagging fibre and rust falling onto your glaze pieces. All Paragon kilns have elements deeply fitted in dropped, recessed brick grooves, pioneered by Paragon, to protect them from expensive glaze or kiln wash damage. The sheer craftsmanship of the close fitting brickwork joints just shouts quality when compared to other kilns. Fitted for the European market with lid operated microswitch to cut off the power when a live kiln is opened. The kilns are digital-automatic. Enter a pyrometric cone number and speed to begin firing or develop your own firing profile with up to eight stages. You can use the delay fire feature to suit your firing schedule. The kiln displays the temperature throughout the firing and cooling. Vent in two stages with the fall-away Prop-R-Vent. An optional fan assisted kiln vent is an extra which can be fitted in minutes, enabling kiln fumes to be ducted up to 60 feet if necessary. The full-formed steel base strengthens the kiln and completely covers the reversible brick bottom. Each kiln comes with its own sturdy self-assembly stand, complete with grippy plastic feet, a full furniture kit of shelves and shelf supports, and a detailed instruction and service manual. The front control box falls away on a hinge and strut system for ease of servicing. Watch a video on how to program a Studio 1 kiln here. or maybe watch this comprehensive video showing how to install a new Studio 1 here. 1 inch wide Square Posts, 4 of each - 1/2", 1", 2", 3", 4", 5", 6"
Fireclay shelves and posts used inside the kiln are called 'furniture'. Using kiln furniture, you can stack more ware in your kiln than you ever could by placing them on the bottom of the kiln alone. Furniture Kits contain the shelves and posts we recommend for each model. They have been selected to accommodate a wide variety of work for your particular kiln. Shelves and posts are also sold separately when required. Shelves up to 15" wide may be fired to cone 10. Shelves wider than 15" may be fired to cone 8. Shelves may warp at sustained cone 10 temperature, therefore, we do not guarantee shelves against warpage.